Algebra 1 Learning, Mastery and Remediation Software | Math Tutor Inc.
interactive learning and tutorial program for first year algebra. , and the many other topics that make up first year algebra. Dynamic, engaging lessons use graphics and animation to help students learn the concepts of elementary algebra, master problem-solving, and gain the confidence so important to future math success.
" course. It helps students gain a solid understanding of the fundamental concepts that underlie algebra. With this strong foundation, many students are eager to share their newfound knowledge and explain algebra to their fellow students. 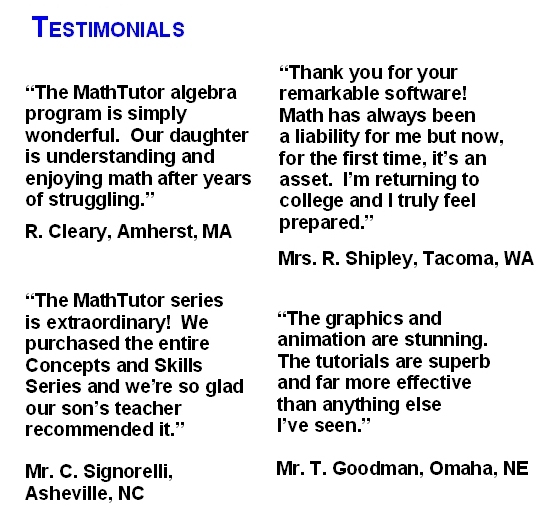 Educators agree that ALGEBRA 1 is a breakthrough in algebra educational software. Carefully crafted lessons provide a unique learning experience and help students gain a visual understanding of the concepts of algebra. In addition, students receive personalized on-demand coaching and hints as they learn. Parents wanting homeschool algebra 1 self-study learning software will find the program to be ideal. will find the program to be perfectly suited to their needs. ALGEBRA 1 has been acclaimed for its educational excellence, design, and flexibility. It can be used for self-study and to supplement classroom instruction in high school and middle school math classes. The program also provides diagnostic and assessment features which create individualized study plans for students. Designed by math educators and research based, the program provides interactive algebra 1 lessons suitable for students at all levels of ability. The program is also effective when used as software for developmental and remedial math teaching.